There’s no better way to enjoy our nation’s birthday than to invite friends and family over for some sunshine-filled fun with backyard grilling and splashing in your swimming pool! Your home’s outdoor space and pool can provide the perfect backdrop for celebrating the Fourth. After all, hosting social gatherings like this may be one reason you wanted a backyard pool in the first place! Red, white and blue are the colors of the day and make for a vibrant color combination. Play them up prominently in your backyard with balloons, streamers, and tinsel decorations. You can get the USA-theme décor rolling at your front door: Let your guests know they’re at the right place with some color balloons on your mailbox, lamp posts, or fence pillars. For your backyard patio, you can choose from all kinds of holiday decorations to hang from awnings, cabanas, overhangs, and in front of tables. Stars and stripes buntings and banners are an affordable option for your deck or to line any fences around your patio. And of course, you can hang or plant one or more American flags in any number of spots around your yard. You can even set up an inflatable Uncle Sam that will look great in pictures with your guests. When it comes to tableware, it’s easy to find options that help decorate the party scene. 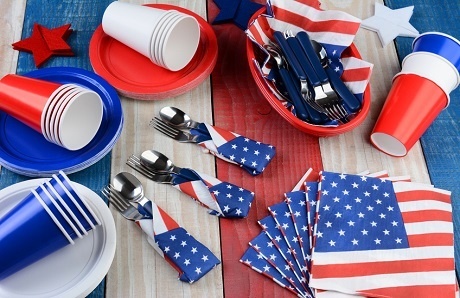 Shop online or at a party store for coordinated sets like a stars & stripes design. This collection of table décor should include disposable plastic or paper plates, cups, napkins, silverware, and tablecloths. Don’t overlook serving bowls and utensils. Check your kitchen for tongs, large spoons, ladles, dip bowls, and salad bowls in the appropriate colors. You may also want to buy some inexpensive plastic serving bowls and utensils, which are often available in bright red. Get the food and drinks in on the holiday spirit too! 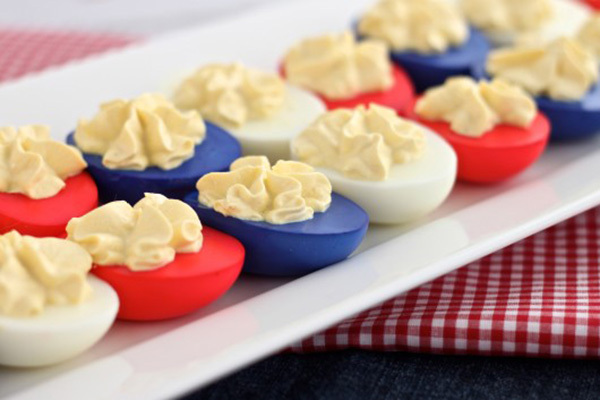 Finger foods are a good bet, and one creation to consider is patriotic deviled eggs. After hard boiling, shelling, and slicing the eggs in half and removing the yolks, take the white halves and dye them with red and blue food coloring. For a more intricate design project, try a platter of American flag fruit kabob with blueberries, strawberries, and sliced bananas. Dessert can also serve as décor: Red, white and blue cupcakes, cookies, or a cake iced with an American flag will have your dessert table booming with USA pride. Your drink station provides yet another opportunity for displaying Independence Day spirit. Consider beverages that fit the colors of the day—like a bright red punch or blueberry lemonade—and show them off in clear pitchers or punch bowls. For even more fun with festive drinks, go for layering. Using clear, patio-safe drinking glasses, you can pour layers of red, white and blue juices and crushed ice for a surprisingly simple “wow” effect in everyone’s cup. You can use a variety of ingredients, and here is an example of one easy recipe. When decorating your backyard for the big event, don’t forget about your swimming pool. You can add inflatable tubes, balls, rafts, and color pool noodles for guests to enjoy while they’re in the water—and if no one jumps in, the bright colors will look great. When the sun goes down, add some red, white and blue floating party lights into the water to enhance the holiday atmosphere. 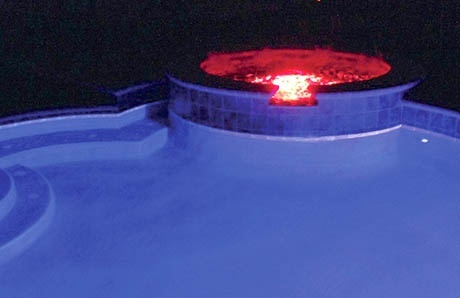 Better yet, if you have color LED lighting on your pool, set the colors to red or blue. If your LED system has light shows—pre-set programs with rotating colors—pick one with reds and blues in it; in fact, some pool LED systems even offer a specific “USA” option perfect for your backyard bash. With advanced LED pool lighting systems, you can choose red and blue to wrap your pool & spa in a patriotic show of color! If your event includes swimming, towels can bring even more color into the scene. Any guest who goes into the pool will need a towel. You have two options: One is to raid your linen supply for all of your red, white or blue towels, and lay them out next to the pool so they are readily available for swimmers. The other is to ask guests in advance to bring towels, and suggest they choose those in patriotic colors if they have them. Guests can also wear their patriotism. On your invitations, encourage everyone to don holiday colors. When people arrive, you can also provide them with USA-themed accessories such as hats, headbands, bandanas, or beaded necklaces. Many highly affordable options are available online and at party stores. Not only will your pool and yard look attractive, but your guests will be walking decorations as well! An ideal option is to hang decorative strings of lights. These are available in festive red, white and blue colors. Another possibility is a set of rechargeable LED lanterns. They come with color or color-changing bulbs. You can place them on tables or hang them from trees branches or beams or pillars in your patio area. Introduce a whole other dimension to your party atmosphere by “decorating” your backyard with the sound of music! July Fourth is about honoring America and spending good times with friends and family. Enjoy hosting your party, and have a safe and happy holiday! Along with food and fun, you want your guests to have safe, enjoyable celebration. Toward that goal, provide guests with your safety rules for your backyard pool. These rules educate them and their children about conduct that can help prevent an accident or injury. What creative ways have you decorated your outdoor space for the Fourth or made the party atmosphere especially festive? Leave a comment or tell us on Facebook or Twitter!